A late strike from Jay Rodriguez saw Southampton take a point from their home clash with Sunderland on Saturday afternoon. 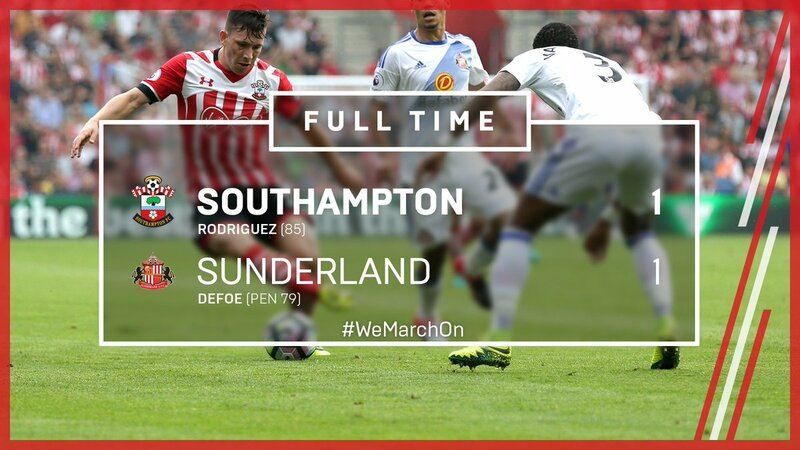 Jermain Defoe fired the Black Cats in front from the penalty spot, before Rodriguez's rescuing effort. Claude Puel made just one change from the side that lost at Old Trafford, with Shane Long dropping to the bench as Charlie Austin was handed a starting berth. Dušan Tadić went close early on, firing narrowly over the crossbar on the half-volley from 18 yards. The Serbian then teed up Charlie Austin for a snapshot from 25 yards out, but Sunderland stopper Jordan Pickford was on hand to make the save. The Black Cats failed to take a massive opportunity when Patrick van Aanholt's cross found Lamine Kone six yards out, but the defender powered his header wide of the target. Cédric was next to take aim, seizing on the ball outside the penalty area before unleashing a left-footed strike that forced Pickford into another save. Fabio Borini took aim from a free-kick after José Fonte felled Adnan Januzaj, but his low effort was easily gathered by Fraser Forster. Nathan Redmond charged forward in the 69th minute before cutting inside and curling a right-footed attempt into the arms of Pickford. The England man was involved again moments later, rolling the ball into the path of substitute Shane Long who sent a low strike toward goal, with Pickford again making the all-important save. Redmond went close again soon after, with Pickford required to palm the ball away as Saints began to build up a head of steam. Sunderland winded Puel's side in the final 10 minutes, with Defoe going down under a challenge from Fonte before taking responsibility for the spot-kick and putting the Black Cats into a one-goal lead. Saints sub Rodriguez saw a long-range strike held by Pickford, but moments later levelled the scores when his low drive squirmed under the body of the Sunderland goalkeeper. Matt Targett then whipped a left-footed free-kick narrowly wide, before Oriol Romeu saw his powerful effort blocked as Puel's wait for his first Premier League win goes on. SAINTS: Forster; Cédric, Fonte, Van Dijk, Bertrand; Romeu; Højbjerg (Ward-Prowse - 82'), Davis; Tadić (Long - 67'); Austin (Rodriguez - 74'), Redmond. Unused Subs: McCarthy, Yoshida, Bertrand, Clasie.